In addition to games for CBSSN, CBS will produce three football games and six basketball games per year exclusively for Facebook. And Stadium will do the same for seven football games and 10 basketball games per year. 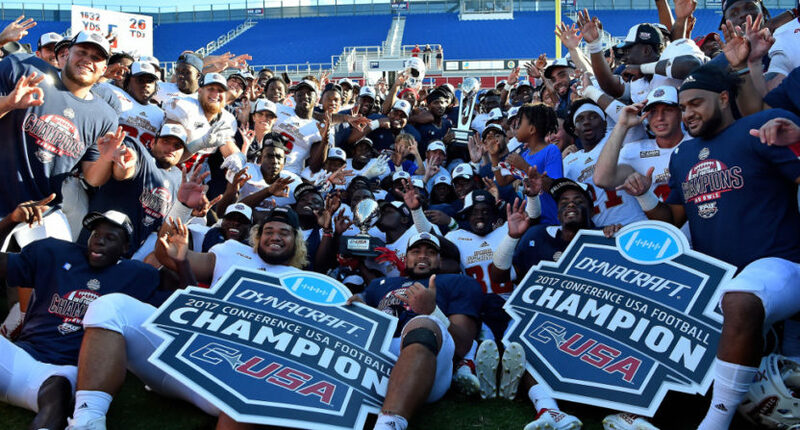 The new Conference USA rights deals announced this week have plenty of interesting dimensions, from a multi-year deal for CBS to become the conference’s primary rightsholder for football (including the conference championship game, which had previously aired on ESPN; the Florida Atlantic Owls are seen above celebrating their 2017 win in that game) and men’s basketball to an expanded partnership with Stadium. Beginning with the 2018-19 season, CBS Sports Network will broadcast nine football games plus the C-USA Football Championship and eight men’s basketball games per year, as well as the C-USA men’s basketball championships semifinals and men’s and women’s basketball championship games. CBS Sports also has reached an innovative deal with Facebook to sublicense and produce select C-USA football and basketball games that will broadcast exclusively on Facebook. The agreement allows for three football games and six basketball games per year to air on Facebook. The games will be a CBS Sports production, with CBS Sports announcers, graphics and branding. Stadium will also be producing games exclusively for Facebook, with seven of the 15 football games and 10 of the 21 men’s basketball games airing only on that social network. (The others will air on “digital and broadcast distribution partners including WatchStadium.com, the Stadium apps, and over-the-air broadcast and cable retransmission in select markets.) So Facebook’s getting a significant amount of live sports content here, and while they’ve struck deals to be the exclusive home for Stadium games in the past, it’s particularly interesting that they now have that kind of setup with CBS for some games. As AA’s Ken Fang wrote last year, the vast majority of tech company deals to stream sports thus far have only involved picking up the existing feeds from television productions, and tech companies have been reluctant to hire their own announcing and production talent and pay their own production costs. Working with Stadium is a step in that direction, especially for games exclusive to one social media service (and that’s a change from last year’s CUSA-Stadium-Twitter deal, which saw games broadcast on Twitter in addition to other Stadium platforms), and having CBS produce content exclusively for Facebook is another step there. And this kind of network-tech partnership makes a lot of sense, as CBS has great announcing and production resources, while Facebook has the desire for more content than CBS can air on its own platforms. It’s not tech companies having their own in-house production, but it’s a step towards it, and a further one than we’ve seen in most cases so far. And it’s something that might be repeated for other leagues. It’s an interesting new world where CBS Sports is creating content that won’t air on any CBS platform, but deals like this might become far more prevalent going forward.